Microsoft Corp.’s latest financial services offering aims to make it easier for the financial sector to convert archaic legacy payment messages into a commonly-accepted international standard and will be available through a Canadian partner later this year. The Redmond-based software giant announced its Financial Messaging Service Bus (FMSB) Sept. 16. This piece of middleware is an add-on to Microsoft BizTalk Server 2009 and targets financial institutions and corporate payment processors. Microsoft promises it will simplify conversion of legacy electronic payment formats to the SWIFT (Society for Worldwide Interbank Financial Telecommunication) standard. BizTalk has been SWIFT certified since 2004, says Colin Kerr, industry manager of payments at Microsoft’s Worldwide Financial Services division. Now it’s easier to handle that format. A look at the Financial Messaging Service Bus dashboard, powered by Silverlight. Big banks, and credit unions are potential clients of FMSB. Big banking is currently going through a shift to catch up to the electronic world, where payments are made in real-time instead of being tabulated on a balance sheet for end-of-day transactions. That’s made possible because SWIFT uses open source XML to process messages. Before the standard, banks worked with a myriad of in-house proprietary coding systems. All Canadian banks currently have SWIFT addresses to receive electronic payments in that format, says Rob Burbach, financial insights senior analyst at IDC Canada. The standard provides the global means to transmit payments electronically. Microsoft will be releasing the FMSB freely to its partners to include as they see fit in their offerings. Montreal-based Expertus Inc. plans to include FMSB in its offerings by the end of the year. As a SWIFT regional partner for Canada, the company can use all products related to the standard, says Jacques Leblanc, CEO. Business should be swift, as every financial institution in Canada is either looking for middleware or has already started using it to move to the new international format. It’s a necessary upgrade for banks that want to stay competitive, Leblanc says. But Microsoft isn’t the only one extending this option to banks as they move to realtime electronic payments. Its competitors are also offering ways to make the SWIFT conversion. Companies such as Oracle, IBM, SAP and Accenture offer competing products. And SWIFT itself is offering its own middleware. FMSB promises to save IT workers inside banking organizations some brain power. It automates SWIFT protocols, technical changes to the standard, and development skills with a range of Microsoft coding platforms. Still, users will need to have a developer and an administrative skills set for BizTalk to configure it. 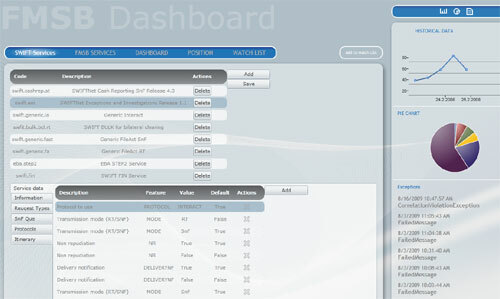 A Silverlight powered dashboard allows users to drill down and view individual messages and services. The service package might be free for Microsoft partners, but it’s not free for banks. Small banks could deploy for around $50,000 while large banks will spend in the $2 million ballpark, Leblanc says. The partner also offers software-as-a-service options.